This top class pet hair vacuum from Hoover has several useful features designed with pet owners in mind. At this price point, it offers excellent value for your money and superior cleaning results. Hoover has designed a powerful cordless stick vacuum, and they haven’t skimped on the handy features added to the product. The set of attachments is superb, and you can trust this stick vacuum to take care of all those messes made by your pet. Click here to read real user reviews on Amazon. The Hoover REACT pet stick vacuum offers some great power and performance with an excellent run time. There are many features that make vacuuming less of a chore and some unique features to especially help pet owners in their battle against pet hair and other pet-related messes. This vacuum is an excellent deal if you’re looking for a stick vacuum for pet hair and guaranteed bang for your buck. The Hoover REACT Whole Home Cordless Pet stick vacuum is genuinely a vacuum for your whole home. 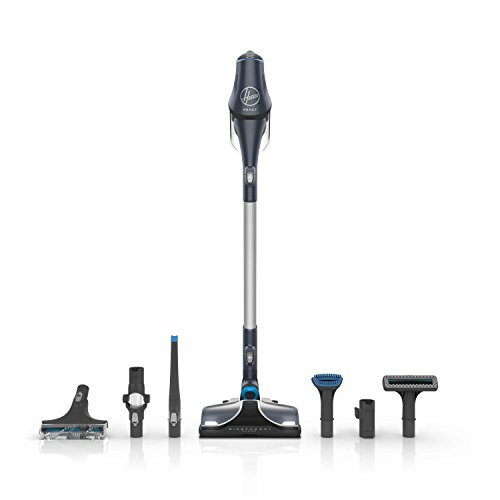 In the stick vacuum configuration, it takes care of all floor surfaces using the FloorSense technology, and with the detachable handheld vacuum and a generous set of attachments, you manage all above-floor cleaning. It is an adaptable and easy-to-use stick vacuum at a reasonable price. The Hoover REACT pet vacuum is something I’m really excited about. It has many great features for pet owners' delight, and it comes at a moderate price. After some research, I was soon convinced that this vacuum would be one of the top 5 stick vacuums for pet hair and other messes made by pets. Hoover has more than 100 years of experience in manufacturing vacuums. They are a well-known and reliable brand known for durable quality products. Again, this vacuum is a good example of how Hoover has not been skimping when adding helpful features in its products. 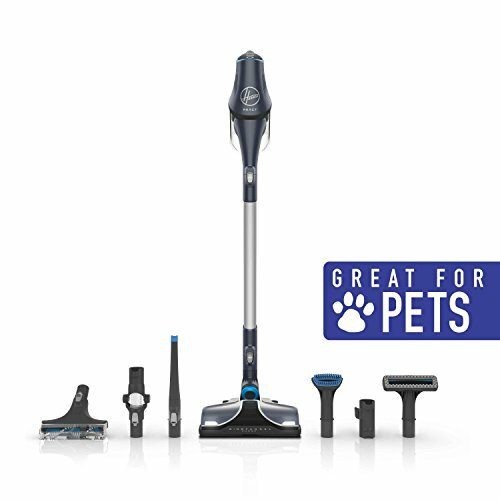 The various smart details in this vacuum that will benefit pet owners is why this product definitely made it to one of our top picks. The vacuum instinctively detects the type of surface you are vacuuming and adjusts the brush roll accordingly to optimize cleaning. When you move from a carpeted area to hard floor, the vacuum automatically slows down the spinning of the brush roll. A lower rotation speed prevents scattering of larger debris still allowing the brush roll to thoroughly sweep any dust and other small particles. When you move back on carpeted surface or rugs, the spinning of the brush roll speeds up again to make sure carpets get a deep and thorough cleanup. This feature is very convenient, because you don’t have to bend down to switch cleaning heads or mind changing the cleaning mode constantly. You just vacuum, and the FloorSense™ Technology takes care of everything. The Hoover REACT comes with an ONE PWR battery, which offers powerful fade-free suction for up to 27 minutes. 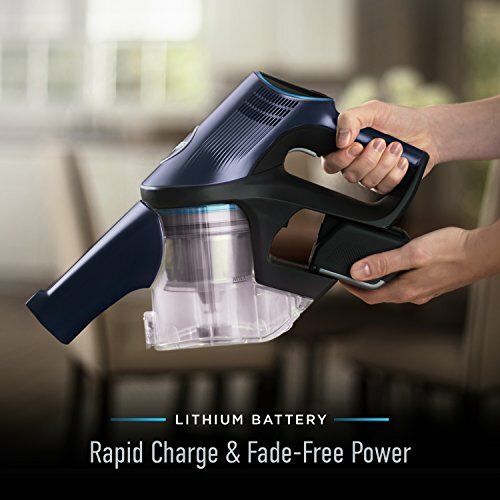 This runtime is pretty good for a cordless stick vacuum with a strong suction, and what I really like about the battery is that you can get a second one to extend the runtime. The battery has to be purchased separately, but if you need more time for bigger cleanups, you have the option. The battery also has a Rapid Charge feature that enables it to be fully charged in only 3 hours. I think this is a nice addition, since most stick vacuums are used frequently, and although you probably don’t need it to be fully charged, it’s easier if charging doesn’t take too long. There is one shortcoming though, which is that the battery can not be charged on the wall mount like with Dyson vacuums. You have to remove the battery for charging, which adds a small inconvenience in using this vacuum. Not a big problem, but something to take note of. With pet homes in mind, Hoover has fitted this vacuum with an extra large 0.164-gallon dirt cup to take in all the pet hair. If you have several pets or just one that sheds a lot, you know pet hair can quickly fill a dirt cup resulting in an extra trip to the trash can mid cleaning. With a generously sized dirt cup, you don’t have to worry about the dirt cup filling up even during the shedding season. Some users have said the vacuum can clog easily, but thorough investigation showed that the decreased suction was not caused by the dirt cup filling up. Hoover offers you exact instructions on how to unclog the air path after the maintenance light has come on. With these guidelines, you should be able to clear the airway and continue cleaning without any problems. Though I found a few people had this problem, most users did not run into any issues with clogging or decreasing suction. If you think you have received a faulty product, the 3-year warranty will cover replacement of the vacuum. I always recommend versatile vacuums because pet hair gets everywhere and it’s crucial you vacuum does too. 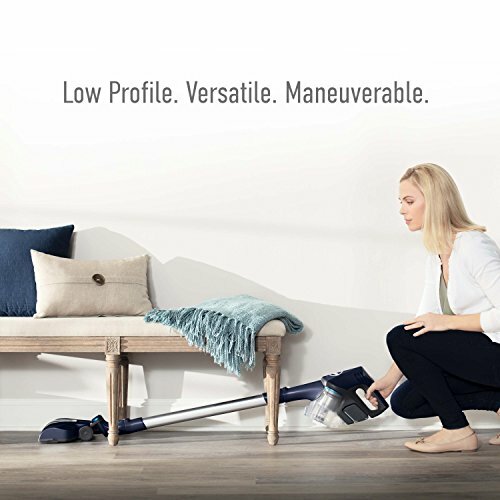 The Hoover REACT stick vacuum has a 2 in 1 design with a detachable handheld vacuum, which you can use for all above-floor cleaning like getting all that pet hair off your couch and recliners. 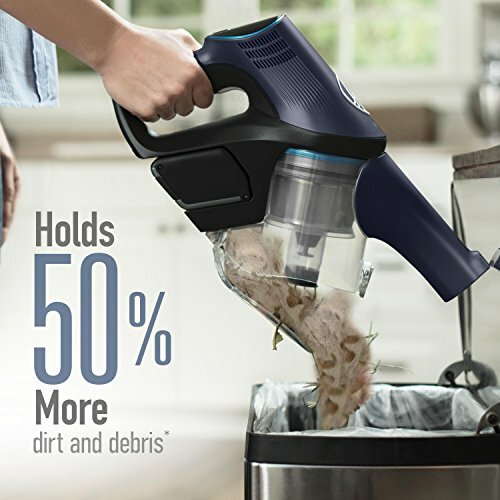 Detaching the handheld vacuum is quick and straightforward, and with the lightweight and compact design, you can reach everywhere from floor to ceiling. The excellent set of attachments brings the adaptability even further offering six different tools for all kinds of cleaning tasks. Scroll down to read more about the tools that come along with this vacuum. The Hoover REACT vacuum is designed to help you vacuum all areas of your home. It has many added features, which are convenient and useful when trying to get to all the nooks and crannies of your house. The vacuum is easily steered, and it comes with headlights to make sure you don’t miss a single spot under furniture. It also comes with a wide cleaning head to make vacuuming of floors and carpets a quicker job. And of course, when you have the whole house to clean, you also need a bigger dirt cup, and that has been added to this vacuum too. With all the attachments that come with the vacuum, it is indeed a very versatile machine that can be used virtually everywhere. The Hoover REACT comes with a two-step filtering system combining cyclonic technology and a washable filter. At the first stage, WindTunnel Surge technology is used to efficiently filter out debris, hair and all kinds of dirt. This cyclonic technique made famous by Dyson vacuums is a very powerful way of filtering out most of the particles in the air before it is guided through the filter and out of the motor. When doing so, the filter will not get clogged, and you can wash it less frequently. After the cyclonic technology has filtered out most of the dirt, the air gets guided through a washable carbon filter, which absorbs odors minimizing the pets smells in your home. We all know pet hair can have that damp smell to it and having the odors removed from the exhaust air is a feature pet owners will enjoy. People with allergies should take note that although the filtering system is very capable, this vacuum does not have HEPA filtration. For a stick vacuum with a HEPA filter, you should have a look at Dyson V6 and V8 or Deik 2 in 1 vacuums. The Hoover REACT vacuum has been designed to tackle all kinds of cleanups, and with the Pet Hair attachments it will take care of all the messes you pets bring about. For removing pet hair from carpets, you have the floor head with a sturdy brush roll that will force out all the dirt and dust hiding between the piles. 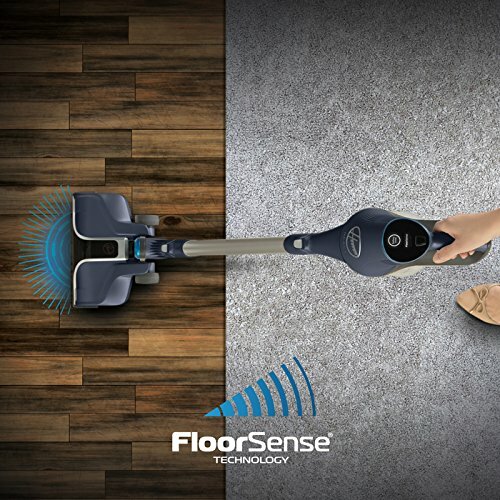 When you move on to the hard floor, the FloorSense technology will automatically turn down the spinning of the brush roll to allow you to pick up hair without scattering larger debris. For tougher upholstery you have a motorized brush roll called the Powered Stair Tool that will use the brush roll with stiff bristles to dig deep into the fabric and pull out all types of pets hair. A brush roll tool like this can handle long thin hair and short needle-like hair alike. If you have more delicate fabrics to deal with, you can also use the Pet Upholstery Tool. It has small nubs with rubber coating that will grasp pet hair much like deshedding gloves. With these tools and a strong suction combined the Hoover REACT is a very efficient pet hair vacuum and therefore one of my top picks. On carpets and rugs, the FloorSense technology turns up the spinning speed of the brush roll to allow a deep clean. With a fast spinning stiff brush roll and a strong suction, the vacuum can reach deep between the piles. A brush roll is the most effective way of cleaning a carpet, and many people are hesitant to buy a stick vacuum because they are not sure if a compact vacuum cleaner has the power to give carpets a thorough clean. If you have thick long pile carpeting and you’re looking for a vacuum to mainly deep clean your carpeting, then I suggest a stronger upright vacuum cleaner for you. But for homes with low to medium pile carpets and for someone looking for a versatile vacuum for more than just carpeted surfaces this Hoover vacuum is a great option. Some reviews said that the FloorSense technology doesn’t always work if the carpet is low pile and it might take a moment for the vacuum to adjust when moving from one type of surface to another. It was however also stated that this is only a minor hiccup, as you can always use a switch to decide which mode you want to use. When you move onto hard floor surfaces, the Hoover REACT spontaneously changes to hard floor mode and slows down the spinning brush roll. With the brush roll still activated but spinning at a lower speed, you can use it to sweep all dust, hair, dander and other small dirt carefully of the floor without the brush roll scattering the larger debris around. According to reviews the REACT vacuum does an excellent job at cleaning hard floors. It won’t scratch your parquet, and with the wide cleaning head it’s not just meant for small cleanups, but you can use it as the primary vacuum too. For upholstery, you have two specific tools. The Pet Upholstery tool has rubber knobs, which draw pet hair up from upholstered surfaces for the strong suction to pull up. You can use this attachment for delicate surfaces, and it works well with most pet hair. If you want to take it up a notch, you can use the Powered Stair Tool. It is incredible when cleaning carpeted stairs, but it also does an excellent job of removing even the most stubborn pet hair that clings onto fabrics. This tool is a great bonus, as not all stick vacuums come with a motorized brush tool for pet hair. You can purchase the Hoover REACT vacuum with a few different sets of attachments, but for pet owners, I recommend the Hoover REACT Whole Home Cordless Pet (BH53220) model, since it has the best set of accessories for picking up pet hair and cleaning after your pets. The attachments include a Crevice Tool, Dusting Brush, Pet Upholstery Tool, Pivoting Extension Tool, Powered Stair Tool, Reach Wand Tool, charger and wall mount. That is quite a package for a reasonably priced vacuum! For pet owners, there are two especially exciting tools: the Powered Stair Tool and the Pet Upholstery Tool. I find that a small motorized brush tool is the best weapon against pet hair clinging to the fabric on your upholstered furniture or bed. The Powered Stair Tool is excellent for cleaning carpeted stairs, but if you want to thoroughly clean upholstery, this is the best tool for that too. For more delicate fabrics you can use the Pet Upholstery Tool, which has rubber nubs to attract and pull up pet hair. It will do a good job with areas that need a more gentle treatment. You also get the crevice tool, which is ideal for picking up larger debris and getting to those tight spots between cushions. The dusting brush can be used for vacuuming delicate objects and surfaces, and the Pivoting Extension Tool lets you get to even the most hard-to-reach places in your home. As Hoover promises, with this vacuum you get a Whole Home Cleaning experience. Hoover REACT Whole Home Cordless Pet Stick Vacuum Cleaner lives up to its name by offering a whole home thorough cleanup. This vacuum is one of the most adaptable and functional vacuums I have come upon when doing my research. There are some small shortcomings that are far outweighed by the positive aspects, and numerous pet owners using this vacuum recommend it to other pet owners. You can’t expect Dyson quality, but with six very useful attachments, a handy handheld vacuum and many helpful features like the headlights, large dirt cup, and FloorSense technology, this vacuum really gives bang for your buck.